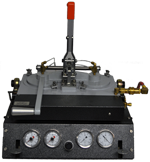 An appropriate set of Change Parts, determined by the type and size of a sample being tested, are installed on the unit. Two ends are placed in the Change Parts and sufficent pressure is applied to either buckle or pass/fail the ends. The water-filled chamber will also reveal leaks in the ends under test when pressure or vacuum is applied. This unit requires the use of Change Parts. The 9001HP uses 9837 Change Part. The 9001LP uses any of the following Change Parts: 9748 ; 9749 ; 9750 ; and 9751.